• It isn’t actually a whole grain – it is a seed from some funky beet relative. • It is a perfect blend of all nine amino acids essential for human nutrition. This type of complete protein is rare in the plant world! Also, if you are keeping track, it is 111 calories in a half cup (cooked) Quinoa. I use Quinoa anytime that I would use rice. It is easy to cook, it puffs up and absorbs a lot of liquid. You can’t go wrong with 1 cup Quinoa to 2 cups water or broth. I really like using Quinoa as both a sweet and savory side dish. It is killer in chill’s (it really thickens it up). I use it for the base of my curries and stir fries. It is also excellent as a base for a Veggie burger. 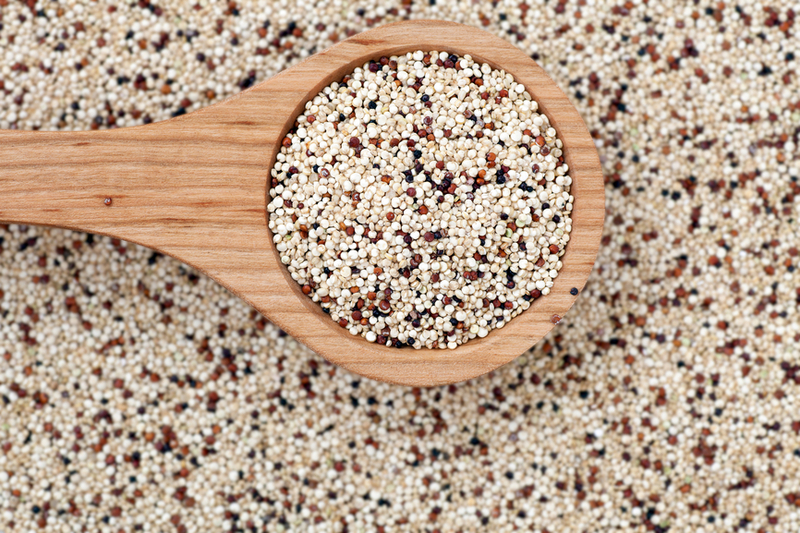 I have used it in baking (I like to hide cooked Quinoa in my brownies – don’t tell my kids!). You can also use quinoa flour as a gluten free substitute for wheat flour in baking and Quinoa flakes make a very low cal/low cholesterol breakfast alternative. I really rely on Quinoa as quick and healthy side dish. My favorite go-to with Quinoa is an apple, cranberry, walnut quinoa “salad” that I love serving with Veggie burgers for dinner or with some carrots and hummus for a quick lunch. Add your veg broth to a medium sauce pan and bring to a boil. Add your Quinoa and continue to boil until all the liquid is absorbed (approximately 15 mins) stirring occasionally. Once the broth has been absorbed remove the pot from the heat and leave covered for 5 mins. Core and chop apple into small pieces. Fluff quinoa with a fork, add all other ingredients and stir thoroughly. Season with sea salt and ENJOY!!! It is some yummy after the ingredients have hung-out for a while (the apples soften and the cranberries plump up a bit) but I usually can’t wait for that long. This was a special request post. If you have any ingredients that you want to try but aren’t sure what to do with them, comment below or contact Lindsay or myself. We would love to help you out.